First the customers revolted. Then housing went into a free fall. Time to slash and burn - unless you're CEO Frank Blake, who thinks an army of orange aprons will save the day. Home Depot employees like to customize aprons for CEO Frank Blake. (Fortune magazine) -- The Home Depot's Francis S. (Frank) Blake has one of the biggest jobs in corporate America but one of its least famous faces. Which is what the CEO is counting on one weekday morning when he goes on an undercover mission in Riverside, N.J.: a secret walkthrough at one of his company's 1,970 U.S. stores. He's been taking the walks an average of four times a week, all around the U.S., since January 2007, when he took over as CEO after Bob Nardelli's abrupt and painful departure. Blake wants to see for himself the way regular folks are treated when they shop at the big orange box. And he's not sure what to expect. "This is going to be like a Cracker Jack box," he says, a bit nervously. "You don't know what you'll get." Things get off to a promising start: Barely are we in the door when an orange-aproned associate asks brightly, "Can I help you find something?" A small smile plays across Blake's poker face. "That's always good," he says, stooping to pick up some pink flower petals that have fallen to the ground. As he makes his way to the carpet section, which has been redesigned so that women customers can actually reach the rugs, the level of service begins to border on obsessive. "You need help with anything?" "How you doing today?" "Folks, you sure you don't need any help?" A shopping experience where employees trip over themselves to help customers is the ultimate fantasy for anyone heading a retail company. But at Home Depot - the second-largest retailer in the U.S., after Wal-Mart (WMT, Fortune 500) - that fantasy has been a long way from reality for a long time. Over the past several years a trip to the big orange box has so often ended in frustration that the company once famous for its helpful employees became fodder for late-night TV jokes and home to hundreds of blog rants about bad experiences with disengaged or scarce employees. (Type "I hate Home Depot" into Google and see what happens.) On the University of Michigan's American Customer Satisfaction Index, Home Depot fell eight points in seven years, to 67 at the end of 2007. It was the largest drop for any retailer in the index, while rival Lowe's (LOW, Fortune 500) remained steady at 75. That kind of deterioration would be a challenge for any newly minted chief executive. (Blake, 59, is a lawyer by training.) But trying to recast the company's image in the middle of the worst housing downturn in decades multiplies the challenge. Does service even matter when recession-spooked customers are avoiding shopping altogether? (In this third year of decline, Home Depot's same-store sales dropped 7.9% in 2008's second fiscal quarter; rival Lowe's posted a 5.3% drop.) Blake, however, is not managing for the here and now, slashing jobs and expenses with quarterly earnings in mind. Instead, he's doing something counterintuitive: He's spending money on the folks in the orange aprons to prime Home Depot for life after hard times. Blake is quietly but aggressively presiding over radical change at the company, starting with a complete reversal of his former boss Nardelli's strategy of dominating the wholesale housing-supply business. Since Blake took over, he has sold off the supply unit, HD Supply, and slowed store growth to focus on quality over quantity, trying most of all to rebuild the sense of pride that employees once had in what they do. "It was a religion at Home Depot that customers had to be happy," says Bernie Marcus, one of the company's three founders. "Over a very short period [Blake] began to realize the malaise that was taking place in the stores." Wall Street analysts have been surprisingly supportive, despite the company's abysmal numbers and lousy reputation. "A lot of what he's doing is very textbook," says Citigroup (C, Fortune 500) analyst Deborah Weinswig. "Invest in a down market when you've got time. That makes sense to me." 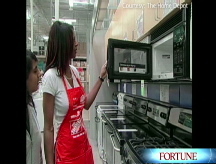 Whatever the economy does, Home Depot won't fully recover until customers trust it again. And that's why, back in Riverside, Blake is doing his best to inspire the troops. Rather than mentioning the flower petals on the floor or a few other infractions, Blake is supportive and encouraging. "Take us around," he says to Pleskach, a 15-year Home Depot veteran. "Show us what you're proud of." Pleskach heads over to the garden area to show off his fleet of lawn tractors and then to the home-services tent, where Bob, an associate who has personalized his orange apron by writing a big smiley face inside the "O" in his name, tells Blake about his success generating leads for expensive jobs like roof installation and house painting. Suddenly a "pro," a customer who's a professional contractor, comes over to put in his two cents. "These guys are great," the contractor says. "I'm trying to get a whole bunch of pallets of tiles, and they're working their butts off trying to get it done. The problem is, I hope they can get it done." "They'll get it done," says Blake, with the air of a doting dad. "I have total confidence." Just 18 months ago, confidence in any form was hard to come by at Home Depot. Nardelli, the GE (GE, Fortune 500) executive who had been chosen by co-founders Marcus and Arthur Blank (who now owns the NFL's Atlanta Falcons) to help bring scale and organization to a company that had outgrown its loose, entrepreneurial culture, had done that - and much more. Believing the home-improvement market would soon become saturated in the U.S. as rivals Lowe's and Menards went on their own expansion drives, Nardelli concluded that Home Depot's future lay in moving further up the chain to contracting and building supply. In just over six years he spent more than $8 billion to acquire 30 companies and create HD Supply, nearly doubling revenues. He also used his experience at GE, with its systems- and data-driven culture, to help centralize purchasing and merchandising, which had never been done. When Nardelli arrived, store managers didn't even have the ability to send e-mail to one another.